An afternoon visit to a local forest preserve turned horrific for a Naperville woman who watched helplessly as her small dog was mauled by two much larger canines. Karine Malec says she and her 6-year-old son were enjoying Friday’s sunny weather when they took Jasper — the family’s 2-year-old Maltese and Yorkshire terrier mix — about 3 p.m. to the off-leash dog area at the Springbrook Prairie Forest Preserve near Naperville. Within minutes of being brought inside the fenced area, the roughly 9-pound dog was surrounded by a five bigger dogs. Malec said two of the dogs — a husky and an unknown breed — suddenly attacked. 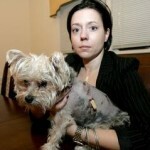 Jasper suffered numerous bite marks, broken ribs and torn muscles before one of the attacking dogs’ owner pulled him from the brief melee. After getting surgery, Jasper had to be kept overnight at an animal hospital. The pooch is expected to recover, although veterinarians are continuing to monitor his progress. So far, the medical treatments have cost Malec about $2,600. Malec said she was so focused on getting medical attention for Jasper that she didn’t get the other dog owners’ names or contact information. She has since reported the attack to the DuPage County Forest Preserve District police and put up signs at the dog area. Malec is trying to find witnesses of the attack while spreading the word that pet owners must be careful at off-leash dog areas. “There needs to be proper education, especially for people who are bringing bigger dogs there,” Malec said. According to the DuPage County Forest Preserve’s website, dog handlers must carry leashes and leash and remove their dogs from the off-leash area at the first sign of aggression. They are responsible for any injuries or damages their dogs inflict on other people or other dogs, according to the list of regulations. The forest preserve district has six off-leash areas throughout the county. The one at Greene Valley Forest Preserve near Naperville has a separate spot for small dogs, Weidner said. Dog owners must get an annual permit to use the off-leash dog areas, he added. Permit holders are expected follow the rules, which include keeping a watchful eye on children at all times. In the meantime, Malec said she hopes the owners of the dogs that attacked Jasper contact her and help pay some of the medical bills. “I can afford it, but it would be nice for them to show that they care,” she said. Even if they don’t step forward, Malec said she will continue her effort to warn other pet owners.